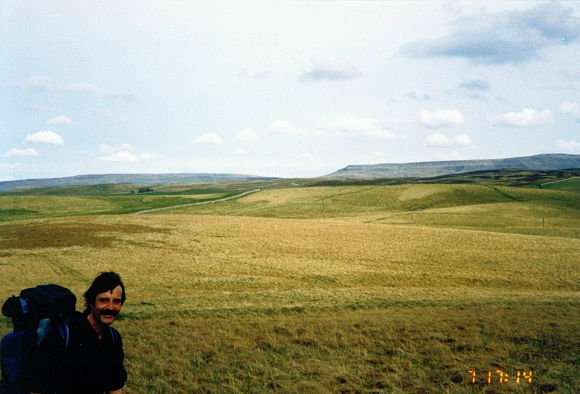 A personal record of my walk in 1994 with written journal and photographs. Tracklogs for GPS units and for use with Google Earth are available for download for each stage. 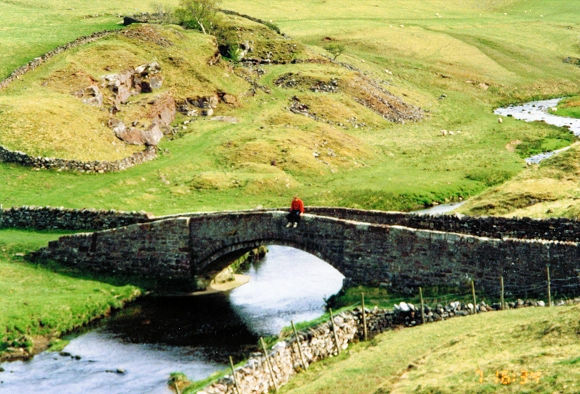 We left Keld in dry conditions and headed out to the Pennine watershed. The going was heavy and apart from the initial two miles from Keld when we followed the infant Swale to Ravenseat the rest of the first half of today's walk was entirely featureless, a case of putting heads down and grinding out the miles. Fortunately, things were to change for us at Nine Standards. At this precise point the clouds parted and the sun shone brightly from the west. If we were spiritual we would have knelt in awe, in reality we just smiled with delight. The rest of our day was bathed in sunshine. We arrived at the market town of Kirkby Stephen (via the picturesque Hartley), the normal stopping point on the Coast to Coast Walk. It was still quite early so while in Kirkby Stephen we discussed the possibility of walking on a bit further rather than stop at 12 miles with 20 to face tomorrow. I wanted to stay the night in town but was outvoted two to one so we made for Bents Farm near Newbiggin where accommodation was available. The boys were right to press on to Bents Farm. And as my change of footwear had seen off the pain of previous days I accepted the decision and followed my two companions through fields, passing under the Settle to Carlisle railway line and crossing low moorland to the beautiful and tranquil Smardale Bridge before arriving at the farm. OK, I grumbled about the extra miles added on to today's leg as I relaxed on Smardale Bridge but I was in less pain now. The change from walking boots to trainers had certainly done the trick. The grumbles were due to fatigue, not pain. Soon I was to enjoy a lovely bath and accommodation in the farmhouse while my hardy pals camped in the garden. This was a day that began hard and toilsome and ended the best yet. I was tired but relieved of the pain from my feet that I had suffered for the previous three days. I knew I would be OK now for the rest of the walk. 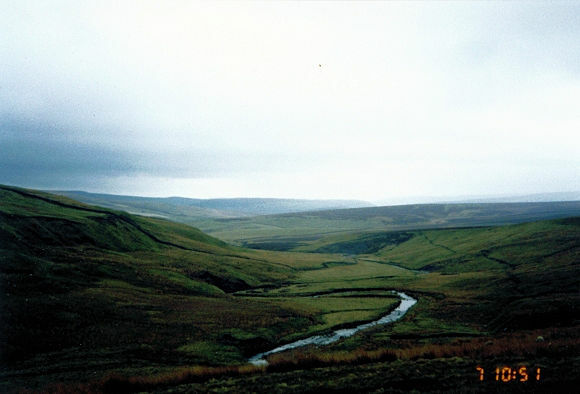 Postscript - The weather as we left Keld on the morning of Saturday 7 May 1994 was overcast but dry, a relief as this leg of the walk involved crossing heavy peaty moorland that is nearly always boggy and a walkers hell in wet weather. 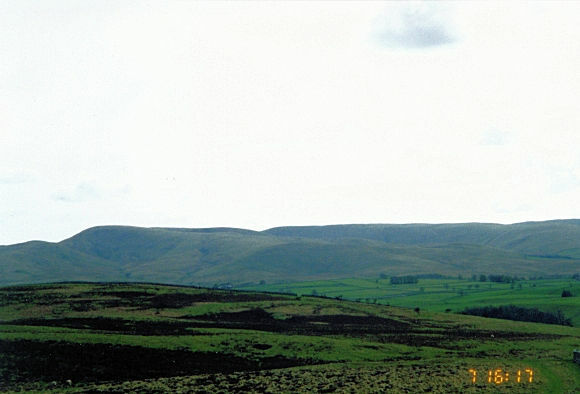 This tramping over moor (and through incessant deep peat hags) stretches for about 8 miles from Whitsun Dale to beyond Nine Standards, a major feature of the Coast to Coast walk. 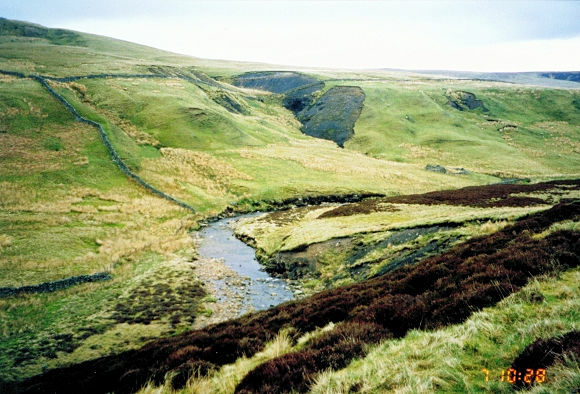 At the Standards you are standing on the county border of Yorkshire and Cumbria and on the Pennine watershed where the flow of water goes west to the Irish Sea whereas previously it went east to the North Sea. Thus, after more than 6 days walking you start to follow water downstream rather than track it upstream as we did with the River Swale. At Nine Standards (no historical site but a viewpoint of note. 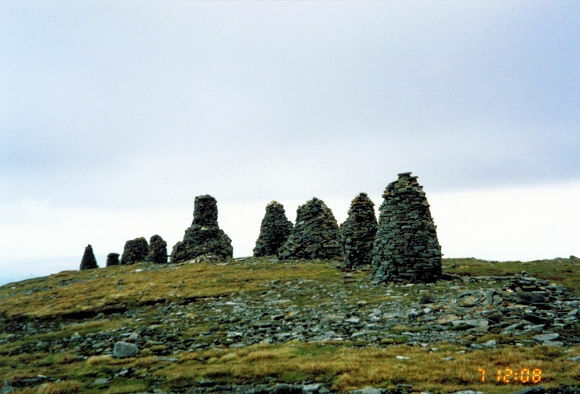 The nine cairns were erected this century by local folk) you have reached the highest point of today, so if you are sodden and disgruntled (as we were!) take heart, it's downhill to Kirkby Stephen.